Yes indeed they were a pair. Scotland’s most notorious murderers in fact. But first a little background for motive purposes. During the turn of the 19th century, the Age of Enlightenment was becoming more prevalent and science was on the forefront of widening humanities grasp on things we take for granted today: hygiene, astronomy, physics, and the workings of the human body. Back then, it was hard for a surgeon or lecturer to get their knowledge greedy hands on fresh cadavers for dissection. Apparently, it was looked down upon…something about hacking into a human body that most found quite unnatural. And thanks to the Judgment of Death Act of 1823, which reduced capital punishment to but five lonely offenses…(luckily in this case murder is one of them)…the number of criminal executions, for whose corpses were used for medical science, decreased sharply. So there Dr. Knox was, sitting about his office at Edinburgh University unable to provide another fresh corpse for lecture (he apparently went through the two or three he may have had). When in walk Burke and Hare (both Williams by the by) right at Surgeon’s Square with a recently deceased acquaintance. What luck! And Knox continued to get lucky…so to speak. Over the course of one year Burke and Hare brought Dr. Knox an estimated 16 unlucky but fresh decaying bodies. And to the sick delight of most giddy students, the corpses range in age from the very young to the very old. Because of the medical students lack of specimens and their insatiable eagerness in presuming to unlock the mysteries of the human (though this has yet to be achieved in today’s science I wager it was particularly hard for them to do so) they had no qualms about the bodies origins…something they really, really, really should have checked up on. You see, the aim was money and Burke and Hare made a lot of it. Based on the currency of the day, they made off with well over $1,000 US in today’s money on a single body. Body snatching (or resurrectionist as a profession) was a lucrative business at the time and so many medical scholars hired men experienced in such underhanded activities, such as Burke and Hare who were laborers, to give the shovel and cart a go. The only difference was Burke and Hare never unearthed a body and the only shovel they used might have been a murder weapon. They only made it look like they had. dug them up They were ahead of the game and found it easier to kill for bodies than to wait around for someone to keel over naturally. The first “victim” truly did die of natural causes. Since the man owed Hare rent money for the lodging house his wife ran, they decided to get in back by quite literally taking it from his skin by selling the body to the school. They then killed off every sick or elderly tenant until there were no more “easy deaths”. At which point they lured and killed their other victims with the help of Hare’s wife. In this case, the body snatchers go from grave robbing to anatomy murders and these two are by far the most famous…or infamous. But as gruesome as their acts were…it gets even better. Soon after they were caught on Oct 30, 1828 (I don’t know why I added this date, it just seemed really ironic they mentioned it specifically) the evidence was not enough to convict or not really enough to satisfy a hanging… so here comes the deal. Hare offered testimony for freedom and that was enough for the judge. 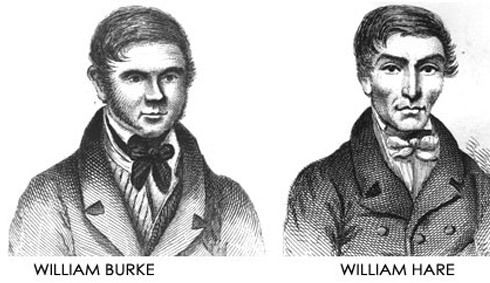 And now I shall re-mention the aforementioned Judgment of Death Act for it was because of this William Burke was then executed by hanging the following January for murder. (Irony, one of the only ways to be executed was to execute someone else.) Since he was the only one accused in court of the crime of murder he even had a word put in the dictionary about him which turned him into a verb! Business Card Holder made from Burke’s skin. 2. To avoid; disregard: “To make The Tempest a tragic and depressing play he was willing to burke all the elements that made it the exact opposite”(Robert M. Adams). 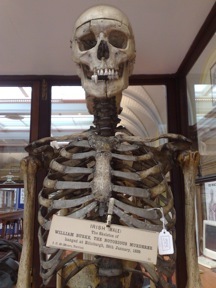 After his execution, Burke was taken to University where his body was dissected for science…if only that were it! He was cut up alright, and had a message written in his blood by the performing surgeon and all the rest of him is still on display at the school…including items made from his tanned skin (Ed Gein much?). Hello, Neat post. There’s a problem along with your web site in web explorer, could test this? IE still is the marketplace chief and a big section of people will miss your wonderful writing due to this problem. Nice post. I used to be checking continuously this blog and I’m impressed! Extremely useful info specially the remaining phase 🙂 I care for such information much. I used to be looking for this particular information for a long time. Thank you and best of luck. I thank you and I’m so glad you like it! That is really fascinating, You’re an excessively professional blogger. I’ve joined your rss feed and look ahead to looking for more of your excellent post. Also, I’ve shared your website in my social networks!